As illustrated in the table above, average returns (as on date) of Hidden Gems stocks recommended in 2017 till August is 25.5% compared to small cap index average returns of 16.5%. 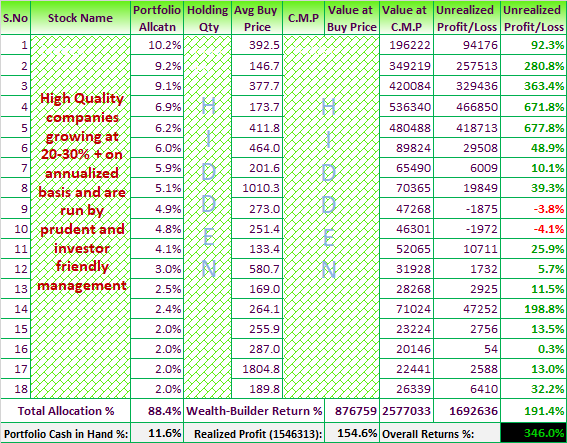 As on date, Hidden Gems stocks are outperforming small cap index by 9%. Our Value Picks stocks of 2017 also outperformed Mid Cap Index. Average returns (as on date) of our Value Picks stocks is 37.9% compared to average returns of 14.3% of mid cap index, out-performance of 23.7%. Now you can add power to your equity portfolio by investing in best of small & mid cap stocks - Hidden Gems & Value Picks. Click here to know about our services and discounts applicable on our combo packs.